The story of Hebrew Senior Care began 116 years ago because of a strong group of dedicated women who believed the Hartford community needed a facility to care for indigent elderly Jews. This group of women became known as the “Handkerchief Brigade” because they would go door-to-door collecting nickels in their handkerchiefs. It took ten years, but they raised the money required to purchase the first Home. The Handkerchief Brigade became what is known today as The Auxiliary of Hebrew Senior Care. And just like those founding women, today’s Auxiliary members are passionate volunteers, dedicated to preserving the tradition of personalized, quality care for seniors. Auxiliary members provide Senior Day Center clients with musical entertainment, volunteer in the Main Street Café and work in the Auxiliary Gift Shop. Regardless of how you decide to get involved, we guarantee you’ll gain more than you give and truly make a difference in the lives of many. Yes, I want to brighten the life of a senior and join the Auxiliary of Hebrew Senior Care! 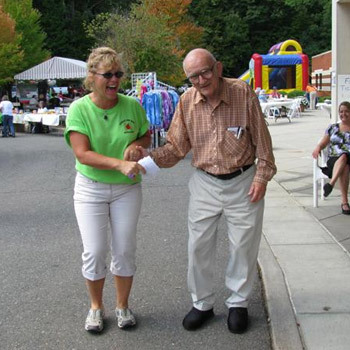 For more information about the Auxiliary of Hebrew Senior Care, please contact Bob Pellegato at 860-523-3829 or by email at auxiliaryhhc@hebrewhealthcare.org.